While nationalists agitate over the Macedonia naming dispute, the Macedonian left is seeking alliances with progressive forces in the region. For background on the “naming dispute,” see this companion piece by Stathis Kouvelakis. The tension created by the “naming dispute” between Greece and the Republic of Macedonia and the complexities of the domestic politics in both countries have made it difficult for its left to engage in a cross-border dialogue. In Macedonia, the ruling social-democratic party, a successor of the one-party regime of the Yugoslav era, is implementing neoliberal policies while pursuing a deeper integration in the Western bloc. In Greece, Alexis Tsipras and Syriza buckled under domestic and international pressure to become loyal executors of privitization and austerity. There are, however, forces in both countries that resist that disastrous course, opposing both nationalism and neoliberalism. In this interview, Stathis Kouvelakis, a member of Popular Unity in Greece, and Nikola Slavevski from the newly created Macedonian party Levica (“The Left”) discuss the current rising nationalist tension and increasing US involvement in the Balkans and the way the Left should respond. Let’s start with the state of public opinion in your country on the ongoing talks between the Greek government and the Republic of Macedonia on the so-called “dispute over the name.” Along with the change of the name of Skopje’s airport from “Alexander the Great” to “Skopje International Airport,” Zoran Zaef announced that he would accept a composite name, with a geographical indication alongside “Macedonia.” Is a broader consensus possible at a domestic level around such a proposal? Could that get the qualified majority in the parliament that is necessary for any constitutional change? The current president of the right-wing opposition [VMRO-DPMNE] has been visiting Washington, DC these days and had a meeting with Trump, a further confirmation that VMRO-DPMNE never opposed American policy. Political elites in the Republic of Macedonia are submissive to imperialism because they need international support to maintain their rule. I think that if American interest decides to have constitutional change, there will be a qualified majority in parliament. Western imperialism needs this issue to be solved because of the integration of Republic of Macedonia in NATO, and it will be solved. As to the change of the name of Skopje airport, I think that was the right decision. The airport was named “Alexander the Great” in 2006 as an act of provocation of the VMRO government in the context of the escalating tension at that moment. This brings us to the crucial question of NATO. 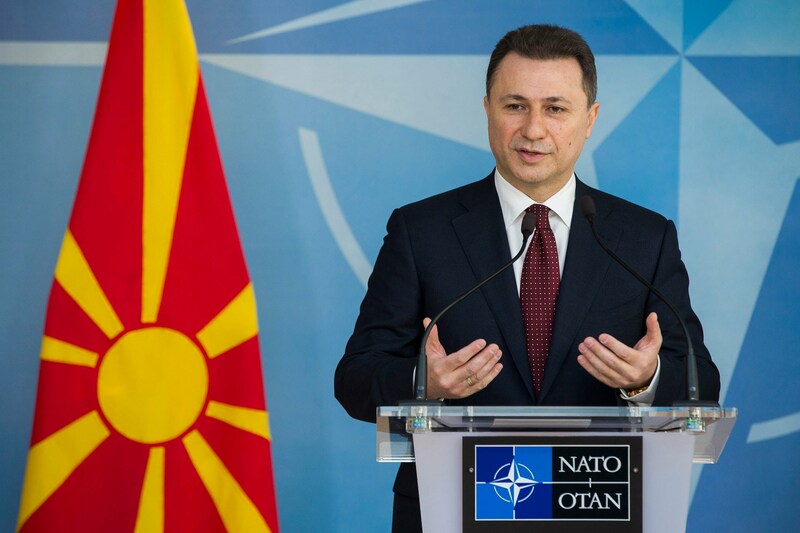 It’s clear to anyone following the situation that the reason the negotiations between Greece and the Republic of Macedonia resumed and intensified is to allow the latter to join NATO, and eventually the EU. There are even clear deadlines for the completion of the negotiations which are the forthcoming NATO summit in July 11 and 12 preceded by an EU summit in Sofia in May 17 devoted to the enlargement of the EU in the Western Balkans. What is your assessment of NATO’s enlargement, which the Greek radical left categorically opposes? NATO is nothing but an imperialist tool of repression. NATO is a pact for war and aggression, NATO is a relic of the past. Levica opposes the integration of our country into NATO. We don’t want to participate in any way in the repression of other peoples. Joining NATO will not bring anything positive to the people; instead we will have to spend 2 percent of the budget for military. That money could instead be used for social programs, health care, or education. Do you think the question of joining the EU should be dissociated from NATO membership? What role did the EU play so far in the domestic politics of your country? EU integration is distinct from integration into NATO; there are EU countries that are not members of NATO. The role of the EU in the region is large but EU diplomacy is soft, the hammer of Western imperialism here is American diplomacy. Anyway, we stand for European integration but the EU needs to be restructured as it is founded on the bases of capitalist and imperialist interests of the core countries. The union of the European people must be on the bases of equality and balanced development, not on capitalist interests. And for such integration first we need regional cooperation on the Balkan Peninsula. In the Greek media there is constant talk of the “irredentist views” of the Republic of Macedonia attributed to passages in the constitution. Is there any substance to this accusation? Was the type of nationalism promoted by the VMRO-DPMNE governments, and the use of symbols drawn from antiquity, the expression of such an irredentism? When the Republic of Macedonia took its independence from Yugoslavia there were, in the context of the growing nationalism of that time, some statements by the then newly formed VMRO-DPMNE party that they will hold their next congress in Thessaloniki. Statements of this type are characteristic of the nationalism in the Balkans but they are no real threat to the existing borders in the area. Since that time VMRO-DPMNE underwent a lot of splits and was transformed into a populist party. It used nationalism to ensure its rule, but as we have heard from the audio material released during the wiretap scandal, VMRO-DPMNE had actually accepted positions similar to SDSM (Social Democratic Union of Macedonia) on the name issue. However, what is more important to understand is why VMRO-DPMNE and the Right needed this “antiquization” of Macedonian identity. It is clear that nations are a modern concept and are created with the formation of the national state. It is also clear that right-wingers need the myths of the glorious national state. But the construction of Macedonian national identity is very atypical. This identity was not constructed by the Right but by the Left because the Left was republican and didn’t want in the process of liberation from Ottoman rule to join any of the monarchies in the Balkans, so it started the Macedonian question as a political question for sovereignty, and later as a national question. As we know from history, the Macedonian nation was created in 1944 with the formation of the Democratic Republic of Macedonia, later renamed the Socialist Republic of Macedonia, within Yugoslav federation. But that federation was a socialist workers’ state, not a national one, so the Right couldn’t create a myth out of a socialist state, and the current one didn’t appear to be such a glorious state. In order to create the myth for their narrative they turned to antiquity. Concerning the irredentist tendencies of the Republic of Macedonia, it is sheer exaggeration which has nothing to do with reality. If we look at the economic condition of Macedonia, our economy is dependent from Greek capital. So, if this state wants to continue to exist it needs Greek capital, and Greek capital pursues its own interest because of cheap labor here. When we look at the military situation of the Republic of Macedonia, we see that it is very weak. It has no more than 5,000 soldiers, with poor military equipment. There are no military bases close to any border. It is more generally the weakest military force in the Balkans. The Greek state has far greater military capacity. The Macedonian capitalist class is incapable to maintain social order without the help of Greek and international capital. Therefore, the interest of Macedonian capital and the state is not to confront the Greek state but to build an alliance with it. The thesis about “irredentist tendencies” is therefore just propaganda to maintain nationalist distrust between the people of the two states. What is more important is that the interest of working people in the Republic of Macedonia is to join the Greek working class in a common struggle for their rights. The workers in the two states have no different struggle, it’s one and the same. The political situation in your country has undergone a significant change after the disclosure of the “wiretap scandals,” in which the leaders of the VMRO-DMNE government were involved. An important popular mobilization followed, leading to the 2016 elections and the defeat of the VMRO-DPMNE. Those scandals revealed the extent of the plunder of the state by the ruling politicians and the corruption that went along the imposition of extremely brutal neoliberal policies. After the 2016 elections, a new coalition was formed around the social-democratic party SDSM and the parties representing the Albanian minority. What is your assessment of the policy pursued by the current government lead by Zoran Zaef? After the formation of the new government people started breathing, the fear present in the time of VMRO-DPMNE government went away, but the state institutions aren’t reformed. New scandals affected the members of the State Election Commission and the compensations they had been assigned. Another scandal came out concerning the compensations of the travel costs paid to MPs, as was the case during the VMRO-DPMNE era. When it comes to the economy, the same neoliberal policies are implemented. The SDSM tries to present itself as a leftist party by playing games with the minimum wage, which was raised from 10,800 to 12,000 denars (175 to 195 euros). But an additional legal loophole also opened up, giving the opportunity for bosses to break the law. In this way the SDSM presents itself as a party that cares for the workers without facing the necessity of confronting the capitalists. They promised new tax policies with progressive taxation but in reality nothing has changed, they are not willing and will not confront the capital. Could you tell us how Levica was formed and what its main objectives are? After several years of protest and social struggles, Levica was formed in 2016 by members of the movement for social justice “Lenka” and the leftist movement “Solidarity,” both grassroots activist organizations, joined by some people who were not members of these organizations. It was formed as an attempt to fill the gap on the left part of the political spectrum, a response to the necessity for a workers’ party, since workers had no political organization to represent their interests in the political arena and in society. The main objective of Levica is to represent the interest of workers and poor people, to organize the workers in their struggle, and to transform the society into a more socially just one. Do you see possibilities for collaboration between Levica and the forces of the Greek radical left that oppose the current nationalist outburst? There are not just possibilities. Cooperation between Levica and the forces of the Greek radical left is a necessity. Cooperation among the left forces in the Balkan is needed in order to constitute a Balkan platform that will unite the Left in the area. Balkan peoples are too often pitted against each other by the nationalists and while they hate each other, their elites are robbing them. Only the common action of anti-nationalist forces will enable the people to see that those on the other side of the border are not enemies but people facing similar problems, and that these problems often need joint action to be resolved. We are looking forward to future cooperation with our Greek comrades on this field. Nikola Slavevski is a graduate of the Faculty of Fine Arts-Skopje. He has been active in the leftist movement Solidarity since 2015 and was elected member of the Central Committee of Levica at the foundation conference of the party on February 6, 2016.